This advert appeared regularly in the Tatler between 1917 and 1919. 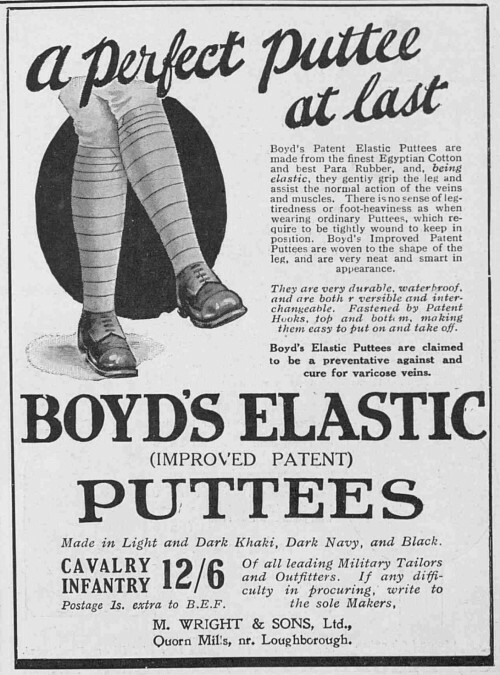 It is advertising Boyd’s Elastic Puttees, which were apparently far superior to normal puttees. It can be seen at the bottom of the advert that they were made by Wright’s elastic webbing factory, which at that time had premises in Loughborough as well as their main base in Quorn. Note that puttees are long strips of fabric that are bound around the legs between the ankle and the knee. They provide ankle support and prevent dirt and water from getting into boots or dirtying trousers. They were worn particularly by soldiers during WW1.